Social Sharing Buttons, Are they worth adding to your site? Social Sharing Buttons, we’ve all seen them, in various stages of persistence. There are entire services dedicated to displaying them on your site. What I want to know, is if it’s worth the real-estate on screen. I have some opinions, but before I jump on my soapbox I can share how often I’ve used these little buggers, and what I’ve heard in talking with others in the industry. These social buttons have been around for years. I don’t think I have ever used one personally to share content. If I want to share content I’d much rather use a URL I choose on my computer, or via my phones built-in sharing. I know I’m not the only one based on discussions I’ve had with other designers and developers. The question though, is whether or not the “average” web user is in the same boat as myself and my colleagues when it comes to using these buttons. One of the more tactful implementations. Many are more… aggressive. Seeing them may gently nudge a visitor to share to their channels. Many allow you to customize what information is shared when someone uses these buttons, so more control for you, the site owner. If you have a counter added to the share button, high sharing numbers may give you a bit more social proof for skeptical visitors. They can distract from the primary reason someone visits your site. Some people (like me) won’t click your buttons even if I want to share your information. I’d rather do it myself. Many sites are too pushy with “sticky” or “floating” buttons. Don’t do this. You will annoy users, especially if they’re not implemented well and block content. 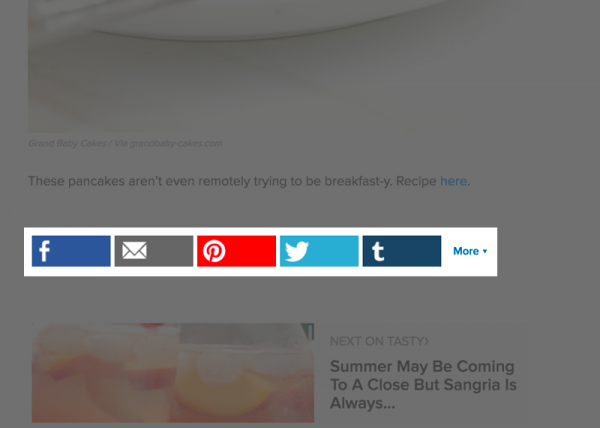 There have been multiple tests of the effectiveness of social sharing buttons. There are a lot of variables that are hard to take into account. The design and interaction of the sharing button(s) are one of the biggest. We can take a look at what some others have found though. Mobile users actually are 11.5 times more likely to tap an advertisement than they are to tap on a social sharing button. Visual Website Optimizer (an A/B Testing SaaS Product) has an article with some interesting data attached to removing sharing buttons as well. It hits on what I think is the most compelling argument against sharing buttons. Specifically the versions that have counters on them to show how many other times items have been shared. I think to really dig deeper into this issue, a test with three variants is needed. It is easy to split test whether a person clicks on a social sharing button. What makes it difficult is to do it on a widespread group of websites to see how multiple websites with different visitors may fare when compared to one another. Another caveat is we can see whether or not someone did or didn’t click on a share button. We cannot realistically know whether or not someone manually shared an article with or without the sharing buttons present. I’ll be revisiting this topic in another post soon with some tests of my own.